Are you frustrated you can lend the German government your hard earned money, and pay them to hold it, for "only" 10 years? Does it bother you Japanese bonds are "only" negative out to 14 years? Have no fear! There is an investment alternative that has arrived which is even further out on the limb of absurdity. Enter the 30 year Switzerland government bond, which as of this morning has now moved negative. You heard that correct. A simple investment today will provide you the opportunity to give the Swiss government your money and then pay them for 30 straight years. You can join all the other proud investors around the world currently holding bonds below the zero bound, a place I refer to as the insane asylum. 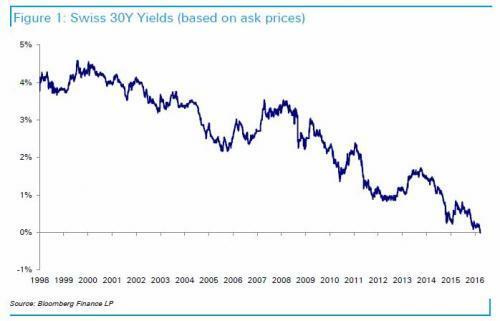 Meanwhile, the chart below made the rounds yesterday in the financial world, which shows a long term history of the 10 year government bond yield in Germany. Investors may take comfort seeing yields also went to 0% back in 1922 - 1923, but a little context is important. What was happening in Germany during that time? Hyperinflation. The bond market was closed during that period so there was no yield. 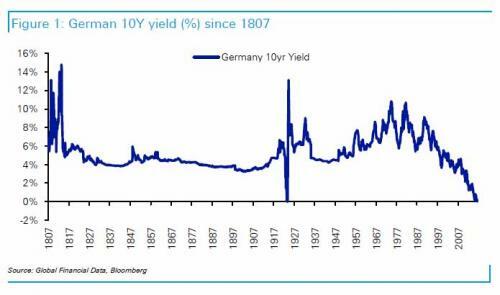 Every German government bond on the planet had a value of $0.0. Why? If the value of the paper currency in your hand was dropping by 10% or more per day, what would be the value of an I.O.U. of that paper 10 years into the future? Much, much less than used toilet paper. Greed: Yields will always continue to fall (even below zero) and we will receive capital gains on the value of the underlying bonds. Concern: Yields bottom and investors realize the top may be in. At this point they will believe yields will only move up slightly, at a slow pace, and then remain at a permanently low trough. (A) Investors will collectively realize the governments they are lending their money are bankrupt and have no way to ever pay back the principal and interest with a currency of equal value in the future. (B) Inflation picks up and investors demand a return (interest rate) high enough to compensate the natural loss of their purchasing power. (C) Both A and B arrive simultaneously, as they did in Weimar Germany in 1922, and the worst case scenario becomes a reality for that country. The question to ask yourself is; where will capital flow when it is flooding out of the bubble bond market? You want to position yourself today to be where capital will flow tomorrow, and do your best to not pay attention to the surrounding noise while you wait.